Summer is hot and we do not miss the opportunity to bathe to try to calm these growing temperatures (and increasingly soon). 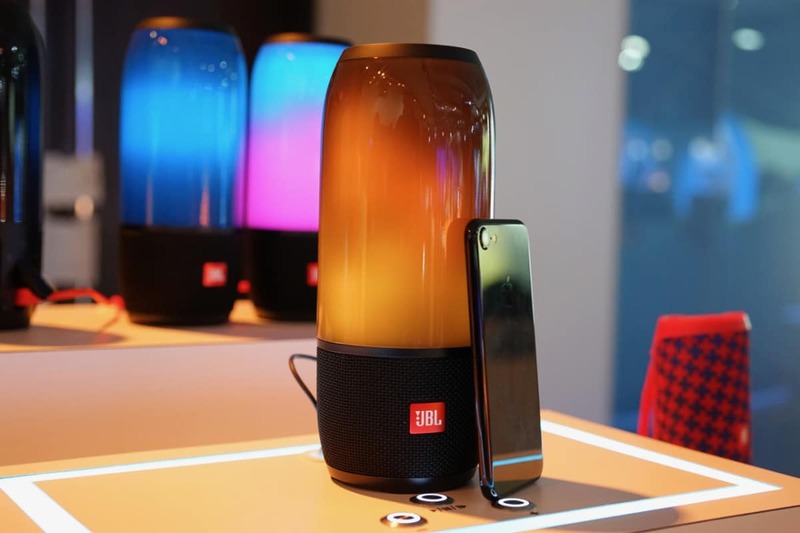 It is not strange that the water resistant is in fashion and now is when it can come better, especially if it gives us to create some atmosphere, such as the speaker JBL Pulse 3, which we bring your analysis. We will not deny that the best thing to prove it has been to refresh ourselves with him without being worried that the water will end the party, but in this product also has prioritized the design and we have verified that it is striking. Wireless and custom lighting, the JBL Pulse 3 is the water-resistant evolution of Pulse 2 and this summer comes to USA. We tell you how it is. The cylindrical or tubular design is relatively common in this type of products, taking advantage of the surface to emit the sound in 360 degrees. In this case it is not all used for this, but the speakers are in the base (behind the grid), with two passive subwoofers in the base and the top face (and that we should not press, although it gives the impression that it is a Great button). Although the highlight is obviously the LED panel also in 360 degrees occupying about two thirds of the cylinder and is one of the main attractions of the product (and also one of the differential factors). Lighting “dance” to the rhythm of music and can be customized, both at the level of pattern and creating one ourselves. To do this you have to pull an app, JBL Connect (available for free for iOS and Android ), which will also serve to link different JBL speakers. There are seven default lighting patterns that can be customized by taking a color for reference (from a palette or around us, thanks to the camera), or create one by selecting the movements of the lights (up to three at a time). It can be selected from the app, or changed from the speaker with the specific button. The physical buttons of the speaker are located on the speaker side, on the base, having one for power on, Bluetooth, selection of lighting, volume, voice assistant (triangle) and connection with other compatible speakers. At the center and under a lid are the USB ports and audio jack, the cap needed to prevent water entry and sealing this space, and above all the LEDs that indicate. The design may be a point to consider when buying one of these speakers, but the crucial and basic thing is the experience with sound. Of power they go well, with a maximum volume of 105 decibels according to our tests gives to settle a stay without missing more decibels, and more so if we connect several. In fact, in the demonstration that we attended by his arrival in USA all the sound came from Pulse 3 speakers connected and located all over the room, either hanging or supported by its base. What stands out is that the quality of the audio will be maintained if we go up to these maximum volumes, being able to leave it at 85-90% of the maximum volume without impoverishing the experience. Of course, the bass are quite protagonists in the composition of the sound and are quite noticeable when we put these levels, perhaps here would be a specific control of the bass via app to adjust them to the taste of the user. The connection is simple, holding down the Bluetooth button to put it in pairing mode (emits two sounds of guitar string and turns blue) and linking from the mobile device that we are going to synchronize. We have not had any problem when linking or using it and looking for the tickles with water or movement, the reproduction has followed without problems. Having a microphone we can use it for telephone conversations or with the voice assistant, in fact for this as we have seen has a specific button. We can start it both from here and from our terminal, although we will have to be glued to the speaker to understand us. It is also heard at a much lower volume than the music we are reproducing. Regarding the autonomy, it will depend on the volume that we adjust in the use. Keeping it at 35-40% (between 70 and 80 decibels depending on what we hear, a level that allows good hearing in a large room or two adjoining), gives us more than 8 hours of hearing during the day, With a load we have to take it quietly if we are not going to resort to high volumes continuously and we will have for a couple of days. Of course, what is missing is that there is some indicator of the remaining battery, for example the charge LEDs on the power button (and indicate the state of charge during it). We have it in the app, which indicates with a progress bar the remaining load (it would not be too bad the percentage indication). And the resistance to water? The speaker is designed to withstand splashes and small dives, always making sure that the connections cover is tightly closed and never wet during charging. We have tested it several times (sprinklers, bucket and rain) and the speaker has continued to run smoothly, making it a good candidate if we want more powerful audio than a mobile device in the pool or shower, for example. The supply of portable Bluetooth speakers has multiplied in recent years and the range of options is very broad, as have traditionally been the headphones and traditional speakers. This almost obligates the differentiation, at least if it is not committed to the low cost (sacrificing in many cases the quality or the volume). The JBL Pulse 3 has gone a step further in this respect with respect to the above, with its resistance to splashes and short dives and a striking design, also in comparison to the competition. These are the two characteristics that could motivate their purchase, rubbing together on quality level with other proposals such as those of Jabra or Logitech. It may be our choice if we are looking for something of quality, audio and construction, and colorful, since investing 284 dollars to have it inside four walls without decorative intent and/or not exposing it to water may not compensate us with respect to other more economical options. Portability is also something to take into account, since it would compensate to invest in a cover (of the officers or not) for convenience and to protect something more the subwoofers (before pressures) and the LED (before scratches).